Geranium macrorrhizum is commonly known as Rock Cranesbill, Bigroot Geranium and Bulgarian Geranium. This wild geranium plant belongs to the genus Geranium (Cranesbills). Geraniums, Pelargoniums (scented geraniums) and Erodiums are members of the Geraniaceae family. Geranium macrorrhizum is a perennial herbaceous plant that is native to Southern Europe (southwest and south of the Alps): on the Balkan Peninsula and the Apennine Mountains. The wild plants grow in an altitude range of about 200 m to 1700 m. They prefer calcareous soils and rather warm locations. The Rock Cranesbill has become an ornamental plant and is a popular groundcover plant among gardeners. Several garden varieties have been cultivated that are easy to grow and to care for! Like many other wild geranium species, this plants fits very well into a near-natural garden and is a superb food and nectar plant for many insects like butterfly, moths, bees, bumblebees, flies and others. Furthermore, birds like to feed on the ripe seeds! This cranesbill species can grow from 20 to 50 centimetres (8 to 20 inches) in height. It is an excellent groundcover plant and under-planting plant for roses, shrubs and other big plants. These plants are also suitable for alpine and rock gardens. The wild Rock Cranesbill has whitish to carmine-red flowers (petals) that are radial symmetrical and have five petals. The sepals have a reddish colour. The blooming period is from June to August, but this can vary depending on the growing conditions. 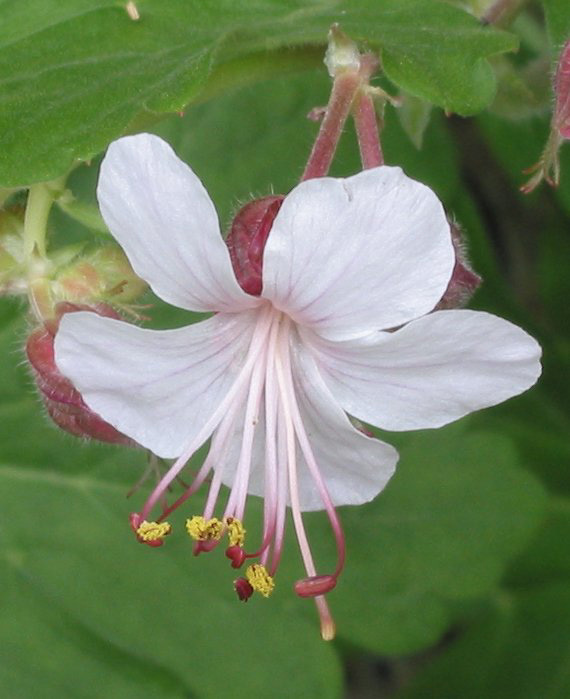 Geranium macrorrhizum plants are shrubs that like to grow in sunny as well as in shady places. The plants tolerate exposed and sheltered locations. Keep the soil well drained and moist, but do not overwater the plants. It will grow in any moderately fertile soil that is mildly acidic, neutral or mildly alkaline. Propagation: The plants can be divided in spring and propagated by basal cuttings in early to mid-spring. The seeds are best sown directly outdoors in autumn or sow them indoors in winter in an unheated room or greenhouse. Pruning: Deadhead them before the flowers grow seeds (or let them ripen the seeds and collect those for growing new plants) and trim side stems to prevent self-spreading. Trim the plants if the flowers and foliage suffer and get ragged during summer time. This will rejuvenate the plants and the flowers and foliage will grow back nicely. G. macrorrhizum 'Album' – Flowers: white to pale pink. Foliage: green and red in autumn. G. macrorrhizum 'Bevan’s Variety' – Flowers: magenta to dark pink with red sepals. G. macrorrhizum 'Czakor' – Flowers: magenta. Foliage: purple tinted. G. macrorrhizum 'Ingwersen's Variety' – Flowers: light pink. G. macrorrhizum 'Spessart' – Flowers: white to pink. Foliage: turns bronze and red in autumn. The leaves are apple scented. G. Macrorrhizum 'Variegatum' ('Variegata') – Flowers: pink. G. macrorrhizum 'White-Ness' – Flowers: pure white with long, yellow-tipped stamens and rather small in size.